Changeling Odo is actually an improved version of Changeling. Changeling is a method for performing a bill change. The main advantage of Changeling over the old classical method of bill change is that Changeling enables the gimmick to “lock” itself and this allows the bill change to take place outside the performer’s hand, for example, in the spectator’s own hand or isolated inside a glass tumbler.Changeling Odo is actually an improved version of Changeling. Changeling is a method for performing a bill change. The main advantage of Changeling over the old classical method of bill change is that Changeling enables the gimmick to “lock” itself and this allows the bill change to take place outside the performer’s hand, for example, in the spectator’s own hand or isolated inside a glass tumbler. • The gimmick is removable, allowing the final transformed bill to be fully examinable. If you do not own Changeling, do not fret. 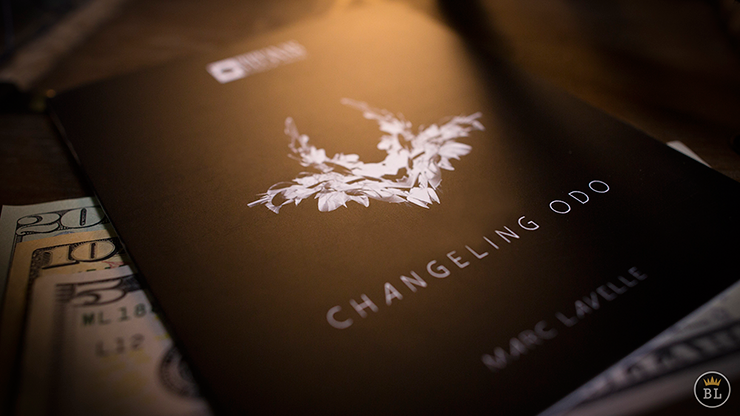 The downloadable instructions include the video for the original Changeling. However, in this video, the audio and the visual are out of sync – the visual is lagging behind the audio and can make viewing it very uncomfortable. The video features Marc Lavelle and he is quite long-winded and repetitive at times, and you have to sit through 1 hour and 35 mins of it. You need to view the Changeling video because it allows you to understand the Changeling method of transforming bill and its applications in 3 different presentations.You receive the necessary gimmicks to construct your own bill gimmicks. You need to construct the gimmick yourself to suit your own currency bills as well as their denominations. You are also given a link to download 3 videos: the original Changeling video (as mentioned), the Changeling Odo video, and a short video as an afterthought of the Changeling Odo video. Marc Lavelle will again take you through how to construct your Changeling Odo gimmick and how to use it. You will have to sit through 1 hour 15 minutes of this video. The DIY is not difficult, it is just tedious and demands precision work so that the gimmick will appear invisible to the audience. • Bill Monte – performer and spectator fold their £10 and £5 bills respectively into quarters. Both folded bills are placed inside the spectator fist. Performer takes out the £5 bill, which magically changes into his £10 bill. Inside the spectator’s fist is her £5 bill. :• Performing with borrowed plastic bills will pose a problem. The spectator’s bill will tend to spring open and cannot be folded flat. A way of overcoming this is to provide your own plastic bills which are already folded flat. Keep one bill for yourself and give the other ungimmick bill to the spectator. She can then feel and examine this bill. • Switching between gimmicked and ungimmicked bills are required in some routines and will require good audience management. • There may be an audibile sound when operating the gimmick bills when performing in a very quiet setting. • The numer of gimmick accessories supplied is sufficient for you to construct the Changeling Odo gimmick and one panel. They may not be enough if you want to construct more gimmicks or panels. You may have to write to the manufacturer to purchase more gimmicks. The name “Invisible Triumph” is interesting. It suggests that it is a triumph card effect utilising, in part, the invisible deck principle. The handling of this special deck is even more intriquing. Several portions of the deck are mixed up with cards facing upwards and cards facing downwards. Yet, without any funny move, the entire deck straightens itself with all the cards facing one way, except for a chosen card which is facing the other way!The name “Invisible Triumph” is interesting. It suggests that it is a triumph card effect utilising, in part, the invisible deck principle. The handling of this special deck is even more intriquing. Several portions of the deck are mixed up with cards facing upwards and cards facing downwards. Yet, without any funny move, the entire deck straightens itself with all the cards facing one way, except for a chosen card which is facing the other way! Here is how the actual routine looks. A spectator selects a card. The deck is divided into 4 piles. The spectator is told to shuffle and lose her chosen card in one pile. The other 3 piles are given to 3 members of the audience to shuffle. One pile is then shuffled face downwards into the spectator’s pile which is face upwards. The next pile is turned face upwards and shuffled into the mixed-up pile. Finally, the last pile is shuffled fasce downwards into the mixed-up pile. For the finale, the cards are gathered together and spread. All the cards have straightened themselves and are now facing upwards, with the exception of one card which remains facing downwards. This card is turned over to reveal that it is the spectator’s chosen card! You receive the special deck and a link to online video instructions. 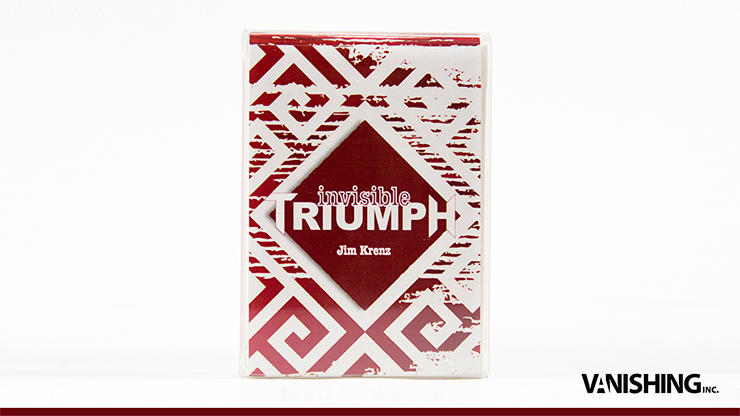 The video has Jim Krenz himself performing and explaining Invisile Triumph. Jim has a comical personality and is an entertaining performer. He offers 2 presentations, one using a stranger card while the other using just the special deck, all 52 cards of the deck. In the latter version, the spectator can merely think of her card, and need not take it out of the deck. The deck looks and handles like a normal deck of cards. You can use it to perform other card effects. But you will not want to do that because it will worn out the special deck and replacement is costly. However, if you wish to perform Invisible Triumph as part of your card act which includes other effects, it makes sense to use this deck throughout so that there is no need to switch decks. Please note that because of its special property for the triumph effect, you should refrain from doing tricks that involve cards facing up and down. The specialty of Invisible Triumph is that your triumph effect looks straight-forward and very convincing, but is easy to do. The property of the deck does all the hard work for you. You only need to understand the procedure of handling the deck. 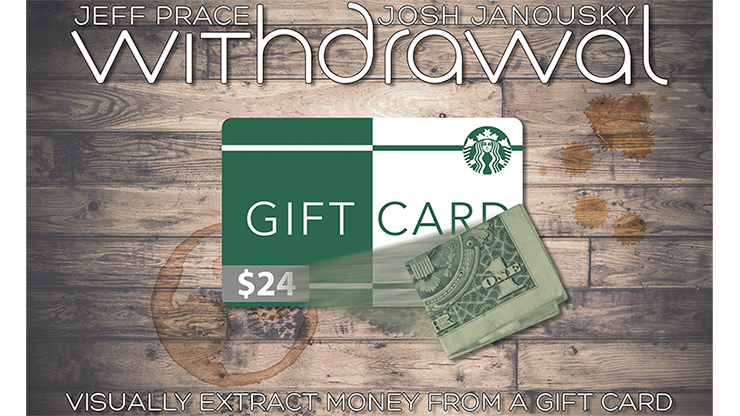 Withdrawal is a plastic gift card that allows you to withdraw money from it. As the money appears from the card, the printed value of the card reduces accordingly!Withdrawal is a plastic gift card that allows you to withdraw money from it. As the money appears from the card, the printed value of the card reduces accordingly! Here is how the actual effect appears to the audience. The performer tells his audience that sometimes he runs out of cash and there is no ATM machine nearby. He takes out a gift card from his wallet. This card carries a Starbucks logo and has a printed value of $25. He asks a spectator to cup both her hands. Suddenly, a folded $1 bill pops out of the card, and the printed value of the card magically changes to $24! He has just magically extracted a $1 ill from the gift card! He continues and says that often, $1 is hardly enough for him. He then proceeds to pluck a folded $10 bill from the card. Once again, the printed value on the card now reduces to $14 accordingly! The card can be handed out for examination. You receive the specially printed gift card and all the necessary gimmicks. You need to construct your own finished prop. Because of this, you are also supplied a couple of construction materials. You are given a link to an online video instructions. In the instructions, Josh Janousky takes you through step-by-step how to construct the gimmicked card. You need to supply your own bills, super glue, glue, repositioning glue and a pair of scissors. The product is available in the following currencies: USA dollars, British pounds, Euros, and Japanese Yen. In the Japanese version, the card supplied is not the Starbuck gift card, but a music stored card. This is to justify for the currency used. The card shows a value of ¥2,500. You first extract ¥100 from it, leaving the card at ¥2,400, and then ¥1,000, leaving the card at ¥1,400.It would be more convenient if the gimmicked gift card is supplied complete and ready for performance, instead of the purchaser having to construct his own. However, this would probably push up the price and make it unaffordable for most people. For those who are not good at DIY, you need to get someone to construct the prop for you. In the video, you are taught 2 different handlings. One is by Josh Janousky and the other one by Jeff Prace. You can choose to use either one, or a mixture of the two. There are several classic magic tricks that do not seem to have a climatic ending. Take the linking rings for example. The entire routine is about metal rings linking and unlinking one another, although the performer may show various ways of doing that.There are several classic magic tricks that do not seem to have a climatic ending. Take the linking rings for example. The entire routine is about metal rings linking and unlinking one another, although the performer may show various ways of doing that. The Oil and Water card trick is another example. The entire act is about black colour cards being able to be separated from red colour cards even though they have been thoroughly mixed. Some performer transform all the cards into 2 sets of different cards altogether as the finale. But this is not consistent with the Oil and Water theme. Here comes Jim Krenz with a truly unexxpected climax that remains true to the mix and non-mix theme. In effect, the performer takes out 4 black cards and 4 red cards from a deck of cards. He then mixes them by alternating black and red cards. When the packet is turned over, the 4 black cards magically separate from the 4 red cards, like oil and water that do not mix. This is carried out one more time. The black and red cards alternate – still they mysteriously separate themselves. The performer takes the packet comprising 4 black cards together and 4 red cards together, and isolate it inside the empty card box. This time, the reverse happens. The black and red cards become magically mixed in a most unexpected way. Each and every card now comprises mixed red and black pips! They are actually printed in permanent inks! Laypeople have never seen such cards before. You receive 8 specially printed cards and a link to online video instructions. The cards are nicely printed in blue bicycle backs. These cards are meant to be used as the climax to your Oil and Water routine. You can use them in the final phase of your own routine. The manner that these cards are designed, they allow you to show 8 cards in a fan with 4 red cards together and 4 black cards together. Then, with a magical gesture, the cards now alternate black and red in the fan. When you separate the cards, the audience gets to see that the pips are mysteriously printed in both black and red colours all over the face of each card – the cards are magically mixed indeed!If you do not have your own routine, the video shows Jim Krenz teaching you his routine. 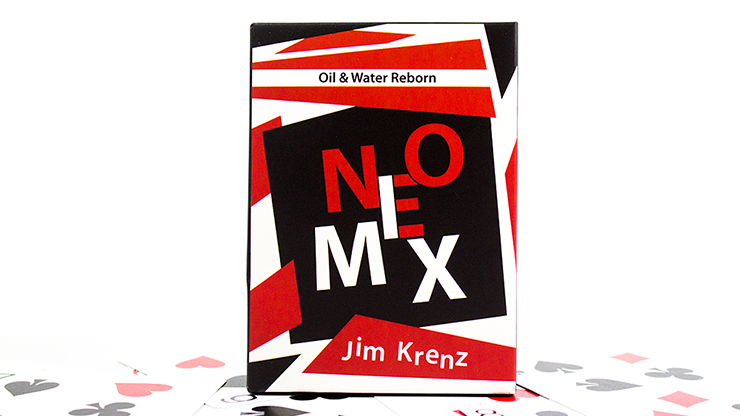 Jim’s routine requires the use of 2 gimmick cards in the earlier phase – these cards are not included in this package, since, as mentioned previously, the supplied cards are to be used in the final phase of your own Oil and Water effect. Jim’s routine is straight-forward and convincing. But, not only do you need the 2 gimmick cards, his routine requires you to be able to do the Hamman’s double turn-over move, the Olram sutlety, to palm cards and to do a packet switch. If these are of concern to you, there are many resources availale where you can learn an easier version of Oil and Water. The name of this effect, ROCA, is an abreviation for Rope Caterpillar. It is a delightful and unique rope routine invented by South Korean magician Moon Tae-Hyun, who is himself a multi-award performer. In effect, the performer takes a piece of white rope and ties a knot on it. He then slips this knot off the rope. To the lay audience, seeing an isolated knot is strange indeed. He puts the rope aside and proceeds to untie the knot into a short piece of white rope about 7” long. Suddenly, this short piece of rope becomes alive! It magically wriggles along his arm like a white caterpillar. It weaves through the fingers of both his hands. Ocassionally, it attempts to jump off the performer, but he manages to catch it before it lands up somewhere else. Sometimes, it clings to the performer’s arm or finger. The animation of this short rope is most weird, but it is fun to watch! Finally, the rope caterpillar changes into a cigarette for the performer. The animation of the short piece of rope looks like the colourful magic caterpillar that is sold widely in magic and other shops for children, which works with an invisible thread. This rope caterpillar does not use thread. It makes brilliant use of a common gimmick that is familiar with professional magicians. You receive the very well-made rope in white colour which is approximately 27” long. At a thickness of about 0.5”, it shows up very well on stage. You also receive 2 rope gimmicks. The rope caterpillar is about 7” long and comes with the animation gimmick. Instructions is in the form of a DVD. In the video, Moon Tae-Hyun takes you through the entire routine. He provides various handlings so that you can choose the one that suits you best. Moon Tae-Hyun also shows 2 other ways of ending the routine. Instead of the caterpillar changing into a cigrette, it can also vanish magically when placed inside his palm, or change back into the isolated knot. Roca is a revolution in rope magic. Most rope magic involves cutting and restoring the rope. In Roca, the knot that is slid off the rope is untied and it becomes a caterpiller. It moves all over the performer’s hands and arm. Finally, it vanishes or changes back to the know, or becomes a cigerette. It is a short routine, having a starting and ending point. This effect is best performed as a parlour or stage setting, not close-up. Roca is not self-working. You need to practise and get used to handling the animation gimmick. But nothing difficult. You will soon be able to perform the entire routine within a short period of practice. Roca is a well made and professional rope effect. You will be proud to own it, and above all, you will want to perform it because it is an unique rope routine that is not commonly seen by anybody. A spectator freely selects (no force) a card and signs it. The performer slides the chosen card into the center of the deck and places the entire deck inside the card case. He takes a marker and draws 2 quick straight lines on the back of the card case to represent a pair of closed eyes. He draws another line – an upward curve to represent an unhappy mouth. He turns the card case around to show the audience of his simple sketch of an unhappy sleeping face. He tosses the case from one hand to his other hand. Instantly and visually, the sleeping face changes into a very angry face with the two eyes wide open and a mouth snarling showing both the upper and lower teeth. The angry sleeping face has woken up. This will cause a smile from the audience. The performer shakes the closed case in his hand. A rattling sound is heard – a full deck inside the case will not make any noise. The case is opened and the performer pours out small cut pieces of playing cards onto the cupping hands of a spectator. 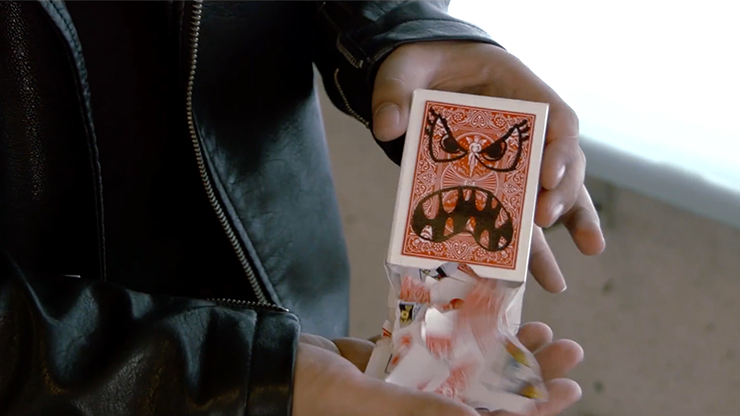 The angry face has “chewed” up the cards into small pieces. This will cause another smile from the audience. As a finale, the performer draws from inside the case the spectator’s signed and chosen card unharmed! • Obviously, the card case must be gimmicked. You need to construct this gimmicked case yourself. It is not supplied. You also need to make another gimmick that will go inside this gimmicked case. The description on the product is a little misleading. It states that “Gimmick supplies included”. Nowhere does it state in the write-up that you have to make the gimmicks yourself. You receive an instructional DVD and some necessary materials to construct your own gimmicks. The DVD, as expected from SansMinds Creative Lab, is of excellent production quality and the teaching, including how to make the gimmicks, is clear and easy to understand. It also covers all aspects of the effect, including tips and alternative handlings. However, to construct both the gimmicks does take more than an average art-and-craft person. This person needs to be a good DIY individual. You also need to supply 4 card cases of your own in order to construct the 2 gimmicks. • Another obvious thing is you have to switch the real items for the gimmick ones. Although you are taught in the DVD on the optimal moments in your performance to do the switches, you need pockets that are large enough to contain both of the gimmicks. • You need to manage your audience. Firstly, the effect cannot be performed surrounded. It is best performed with the audience in front of you. You also need the necessary misdirection to do the switches. If all these comments are of no problem to you, you should immediately go ahead and purchase this effect. You will have a definite winner in your hands. Add 4 more points to the rating here. The advantage of making your own gimmicks is that you can customize your props. Instead of the angry face, you can have other designs of your liking. This is discussed in the DVD. You can also construct your own gimmicks using and brand of playing cards you wish. If the necessary gimmicks were to be supplied, this would easily raise this rating by 3 more points.